We need the help of Monsey community to stop its destruction! Why did Monsey grow in the later part of the 20th century? Because at that time it was a Makom Torah, a place of Torah, in a suburban setting instead of on crowded city streets. But what has happened to Monsey and the entire Town of Ramapo in the 21st century? It ceased to be a place of Torah and instead its growth is that of cancerous tumors of overdevelopment instead!! A place of Torah does NOT have realtors who ignore and disrespect the wishes of Senior Citizens to remain in the suburban area they sacrificed for by offering their neighbors houses not to homeowners but to outside slumlords and developers. A place of Torah does NOT have buyers who violate the Halachos of Bar Metzra, by buying property without it ever being offered to the adjacent neighbors before outsiders. A place of Torah does NOT have residents who fight against a single-family being built next to their backyard while enabling multifamily monstrosities on the next street over. Hillel taught that Kol HaTorah Kuloh, the entire Torah is equal to not doing to someone else that which is abhorrent to you. So how can Monsey still be a Makom Torah when it has such a hypocrite supposedly teaching Torah?! 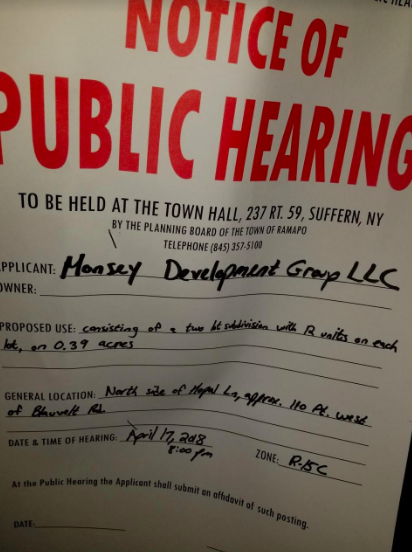 The attached image shows the upcoming Public Hearing for a subdivision of two lots for 12 units each on 0.39 acres of Hopal Lane, a cul de sac that should never have been placed in the R-15C zone for various reasons but mainly because the Town of Ramapo never asked nor notified the residents of the street when it was downzoned! I am asking all residents of the Town of Ramapo to come help my parents stop this destruction of their street. My father was a teacher of both Torah and secular studies at the Yeshiva Rabbi Samson Raphael Hirsch for over 60 years. He would drive to Washington Heights in the worst weather and spend hours in traffic because he wanted his children to grow up in an area as beautiful as Rockland County. Never did he expect the street he chose situated between two brooks to be turned into the type of urban ghetto he moved away from. I am asking all who can to please attend the Public Hearing of the Planning Board at Ramapo Town Hall on April 17, 2018 to show support for my parents and their neighbors.